As the single-largest body in the Asteroid Belt, Ceres has long been a source of fascination to astronomers. In addition to being the only asteroid large enough to become rounded under its own gravity, it is also the only minor planet to be found within the orbit of Neptune. And with the arrival of the Dawn probe around Ceres in March of 2015, we have been treated to a steady stream of scientific finds about this protoplanet. The latest find, which has come as something of a surprise, has to do with the composition of the planet. Contrary to what was previously suspected, new evidence shows that Ceres has large deposits of water ice near its surface. This and other evidence suggests that beneath its rocky, icy surface, Ceres has deposits of liquid water that could have played a major role in its evolution. This evidence were presented at the 2016 American Geophysical Union meeting, which kicked off on Monday, Dec. 12th, in San Fransisco. Amid the thousands of seminars that detailed the biggest findings made during the past year in the fields of space and Earth science – which included updates from the Curiosity mission – members of the Dawn mission team shared the results of their research, which were recently published in Science. Titled “Extensive water ice within Ceres’ aqueously altered regolith: Evidence from nuclear spectroscopy“, the mission team’s study details how data gathered by Dawn’s Gamma Ray and Neutron Detector (GRaND) determined the concentrations of hydrogen, iron and potassium in Ceres crust. In so doing, it was able to place constraints on the planet’s ice content, and how the surface was likely altered by liquid water in Ceres’ interior. In short, the GRaND instrument detected high levels of hydrogen in Ceres’ uppermost structure (10% by weight), which appeared most prominently around the mid-latitudes. These readings were consistent with broad expanses of water ice. The GRaND data also showed that rather than consisting of a solid ice layer, the ice was likely to take the form of a porous mixture of rocky materials (in which ice fills the pores). The concentrations of iron, potassium and carbon detected by the GRaND instrument also supports the theory that Ceres’ surface was altered by liquid water in the interior. Basically, scientists theorize that the decay of radioactive elements within Ceres created enough heat to cause the protoplanet’s structure to differentiate between a rocky interior and icy outer shell – which also allowed minerals like those observed to be deposited in the surface. Similarly, a second study produced by researchers from the Max Planck Institute for Solar Research examined hundreds of permanently-shadowed craters located in Ceres’ northern hemisphere. According to this study, which appeared recently in Nature Astronomy, these craters are “cold traps”, where temperatures drop to less than 11o K (-163 °C; -260 °F), thus preventing all but the tiniest amounts of ice from turning into vapor and escaping. Within ten of these craters, the researcher team found deposits of bright material, reminiscent to what Dawn spotted in the Occator Crater. And in one that was partially sunlit, Dawn’s infrared mapping spectrometer confirmed the presence of ice. This suggests that water ice is being stored in Ceres darker craters in a way that is similar to what has been observed around the polar regions of both Mercury and the Moon. Where this water came from (i.e. whether or not it was deposited by meteors) remains something of a mystery. But regardless, it shows that water molecules on Ceres could be moving from warmer mid-latitudes to the colder, darker polar regions. This lends further weight to the theory that Ceres might have a tenuous water vapor atmosphere, which was suggested back in 2012-13 based on evidence obtained by the Herschel Space Observatory. Back in July Dawn began its extended mission phase, which consists of it conducting several more orbits of Ceres. At present, it is flying in an elliptical orbit at a distance of more than 7,200 km (4,500 mi) from the protoplanet. The spacecraft is expected to operate until 2017, remaining a perpetual satellite of Ceres until the end. Now in orbit for just over a year at dwarf planet Ceres, NASA’s Dawn spacecraft continues to astound us with new discoveries gleaned from spectral and imagery data captured at ever decreasing orbits as well as since the probe arrived last December at the lowest altitude it will ever reach during the mission. Mission scientists have just released marvelous new images of Haulani and Oxo craters revealing landslides and mysterious slumps at several of the mysterious bright craters on Ceres – the largest asteroid in the main Asteroid Belt between Mars and Jupiter. The newly released image of oddly shaped Haulani crater above, shows the crater in enhanced color and reveals evidence of landslides emanating from its crater rim. “Rays of bluish ejected material are prominent in this image. The color blue in such views has been associated with young features on Ceres,” according to the Dawn science team. Look at the image closely and you’ll see its actually polygonal in nature – meaning it resembles a shape made of straight lines – unlike most craters in our solar system which are nearly circular. ”The straight edges of some Cerean craters, including Haulani, result from pre-existing stress patterns and faults beneath the surface,” says the science team. Haulani Crater has a diameter of 21 miles (34 kilometers) and apparently was formed by an impacting object relatively recently in geologic time and is also one of the brightest areas on Ceres. “Haulani perfectly displays the properties we would expect from a fresh impact into the surface of Ceres. The crater floor is largely free of impacts, and it contrasts sharply in color from older parts of the surface,” said Martin Hoffmann, co-investigator on the Dawn framing camera team, based at the Max Planck Institute for Solar System Research, Göttingen, Germany, in a statement. The enhanced color image was created from data gathered at Dawn’s High Altitude Mapping Orbit (HAMO), while orbiting at an altitude of 915 miles (1,470 kilometers) from Ceres. Data from Dawn’s VIR instrument shows that Haulani’s surface is comprised of different materials than its surroundings. “False-color images of Haulani show that material excavated by an impact is different than the general surface composition of Ceres. The diversity of materials implies either that there is a mixed layer underneath, or that the impact itself changed the properties of the materials,” said Maria Cristina de Sanctis, the VIR instrument lead scientist, based at the National Institute of Astrophysics, Rome. Since mid-December, Dawn has been orbiting Ceres in its Low Altitude Mapping Orbit (LAMO), at a distance of 240 miles (385 kilometers) from Ceres, resulting in the most stunning images ever of the dwarf planet. By way of comparison the much higher resolution image of Haulani crater below, is a mosaic of views assembled from multiple images taken from LAMO at less than a third of the HAMO image distance – at only 240 miles (385 kilometers) above Ceres. Dawn has also been busy imaging Oxo Crater, which despite its small size of merely 6-mile-wide (10-kilometer-wide) actually counts as a “hidden treasure” on Ceres – because it’s the second-brightest feature on Ceres! Only the mysterious bright region comprising a multitude of spots inside Occator Crater shine more brightly on Ceres. Most importantly, Oxo Crater is the only place on Ceres where Dawn has detected water at the surface so far. Via VIR, Dawn data indicate that the water exists either in the form of ice or hydrated minerals. Scientists speculate that the water was exposed either during a landslide or an impact. 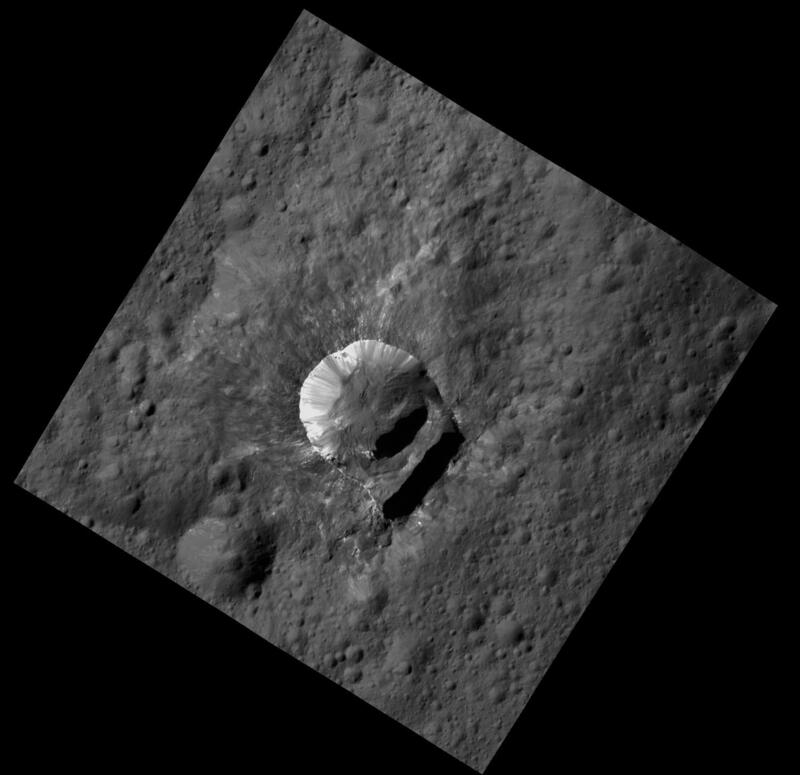 “Little Oxo may be poised to make a big contribution to understanding the upper crust of Ceres,” said Chris Russell, principal investigator of the mission, based at the University of California, Los Angeles. The signatures of minerals detected on the floor of Oxo crater appears to be different from the rest of Ceres. Dawn is Earth’s first probe in human history to explore any dwarf planet, the first to explore Ceres up close and the first to orbit two celestial bodies. The asteroid Vesta was Dawn’s first orbital target where it conducted extensive observations of the bizarre world for over a year in 2011 and 2012. The mission is expected to last until at least later into 2016, and possibly longer, depending upon fuel reserves. Dawn will remain at its current altitude at LAMO for the rest of its mission, and indefinitely afterward, even when no further communications are possible.